ask somebody out invite on a date Brian asked Judy out to dinner and a movie. back somebody up support My wife backed me up over my decision to quit my job. bring somebody down make unhappy This sad music is bringing me down. bring somebody up raise a child My grandparents brought me up after my parents died. call somebody back return a phone call I called the company back but the offices were closed for the weekend. call on somebody ask for an answer or opinion The professor called on me for question 1.
call on somebody visit somebody We called on you last night but you weren't home. call somebody up phone Give me your phone number and I will call you up when we are in town. not care for somebody/ something not like (formal) I don't care for his behaviour. catch up get to the same point as somebody else You'll have to run faster than that if you want to catch up with Marty. check somebody/ something out look at carefully, investigate The company checks out all new employees. check out somebody/ something look at (informal) Check out the crazy hair on that guy! cheer somebody up make happier I brought you some flowers to cheer you up. come from some place originate in The art of origami comes from Asia. count on somebody/ something rely on I am counting on you to make dinner while I am out. cut somebody off take out of a will My grandparents cut my father off when he remarried. do somebody/ something over beat up, ransack (BrE, informal) He's lucky to be alive. His shop was done over by a street gang. do something over do again (AmE) My teacher wants me to do my essay over because she doesn't like my topic. drop in/ by/ over come without an appointment I might drop in/by/over for tea sometime this week. drop somebody/ something off take somebody/ something somewhere and leave them/it there I have to drop my sister off at work before I come over. fill something in to write information in blanks, as on a form (BrE) Please fill in the form with your name, address, and phone number. fill something out to write information in blanks, as on a form (AmE) The form must be filled out in capital letters. get something across/ over communicate, make understandable I tried to get my point across/over to the judge but she wouldn't listen. get back at somebody retaliate, take revenge My sister got back at me for stealing her shoes. She stole my favourite hat. get round to something finally find time to do (AmE: get around to something) I don't know when I am going to get round to writing the thank you cards. give somebody away reveal hidden information about somebody His wife gave him away to the police. give somebody away take the bride to the altar My father gave me away at my wedding. give something away give something to somebody for free The library was giving away old books on Friday. go after somebody follow somebody My brother tried to go after the thief in his car. go against somebody compete, oppose We are going against the best soccer team in the city tonight. go out with somebody date Jesse has been going out with Luke since they met last winter. go over visit somebody nearby I haven't seen Tina for a long time. I think I'll go over for an hour or two. hand something down give something used to somebody else I handed my old comic books down to my little cousin. hang in stay positive (informal) Hang in there. I'm sure you'll find a job very soon. hold somebody/ something back prevent from doing/going I had to hold my dog back because there was a cat in the park. hold onto somebody/ something hold firmly using your hands or arms Hold onto your hat because it's very windy outside. hold somebody/ something up rob A man in a black mask held the bank up this morning. keep something from somebody not tell We kept our relationship from our parents for two years. keep somebody/ something out stop from entering Try to keep the wet dog out of the living room. let somebody down fail to support or help, disappoint I need you to be on time. Don't let me down this time. let somebody in allow to enter Can you let the cat in before you go to school? log in (or on) sign in (to a website, database etc) I can't log in to Facebook because I've forgotten my password. log out (or off) sign out (of a website, database etc) If you don't log off somebody could get into your account. look after somebody/ something take care of I have to look after my sick grandmother. look down on somebody think less of, consider inferior Ever since we stole that chocolate bar your dad has looked down on me. look for somebody/ something try to find I'm looking for a red dress for the wedding. look out for somebody/ something be especially vigilant for Don't forget to look out for snakes on the hiking trail. look up to somebody have a lot of respect for My little sister has always looked up to me. make something up invent, lie about something Josie made up a story about why we were late. make somebody up apply cosmetics to My sisters made me up for my graduation party. pay somebody back return owed money Thanks for buying my ticket. I'll pay you back on Friday. point somebody/ something out indicate with your finger I'll point my boyfriend out when he runs by. put somebody down insult, make somebody feel stupid The students put the substitute teacher down because his pants were too short. put up with somebody/ something tolerate I don't think I can put up with three small children in the car. put something on put clothing/ accessories on your body Don't forget to put on your new earrings for the party. run into somebody/ something meet unexpectedly I ran into an old school-friend at the mall. run over somebody/ something drive a vehicle over a person or thing I accidentally ran over your bicycle in the driveway. run over/ through something rehearse, review Let's run over/through these lines one more time before the show. set somebody up trick, trap The police set up the car thief by using a hidden camera. take after somebody resemble a family member I take after my mother. We are both impatient. take somebody out pay for somebody to go somewhere with you My grandparents took us out for dinner and a movie. warm somebody/ something up increase the temperature You can warm your feet up in front of the fireplace. work something out make a calculation We have to work out the total cost before we buy the house. 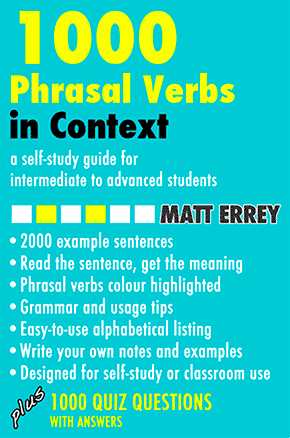 Get Matt Errey's popular 1000 Phrasal Verbs in Context and improve your vocabulary and understanding fast. Download this helpful guide to English phrasal verbs now.